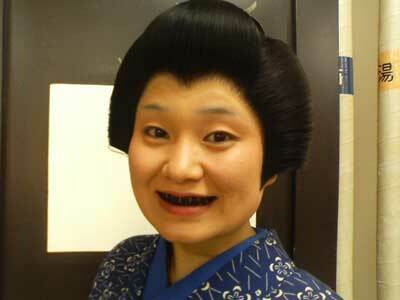 Ohaguro, according to Wikipedia, is a custom of dyeing one’s teeth black and an aristocratic term. It was practised since prehistoric times (traces of blackened teeth can be seen in the buried bones and haniwa from the Kofun period) and remained most popular in Japan until the Meiji era, as well as in the southeastern parts of China and Southeast Asia. Dyeing was mainly done by married women, though occasionally men did it as well. It was also beneficial, as it prevented tooth decay, in a similar fashion to modern dental sealants. A 2006 dental study found that the soot made from three types of plant extracts used by Kammu women in Vietnam and Laos to stain their teeth was found to inhibit the growth of mutans streptococci. Note*Daiwu is in Guangdong, Southeast China. In the Shan Hai Jing, there is also a description of a “black teeth country” (lit. 黒歯国) (Source: Wikipedia). Thus, the practice of blackened teeth was well known in China and right down to modern times today, teeth blackening similar to the Japanese ohaguro practice can be seen among many minority groups in Southeast Asia. The practice is dwindling among the younger women, but remains prevalent in older women among certain of the hill tribes. The main ingredient was a dark-brown solution of ferric acetate called kanemizu (かねみず), made by dissolving iron filings in vinegar. When the solution was combined with vegetable tannins from sources such as gallnut powder or tea powder, it would turn black and become non-water soluble, in the same manner that iron gall ink is produced. Coating the teeth with this liquid helped to prevent tooth decay and enamel decay. The dye had to be applied once a day or once every few days. On February 5, 1870, the government outlawed the practice of ohaguro, so today, the only places where ohaguro can still be seen in Japan is in plays, hanamachi (geisha quarters), some matsuri, and movies. In theatrical plays, ink used to be mixed with turpentine was used, though these days, ink is mixed with tooth wax instead. Yellow teeth are a real turn off, but black teeth are a major turn on, for the ancient Japanese people at least. Ohaguro simple means to blacken the teeth. It is an old Japanese custom that was so popular centuries ago in Japan, and up to the Meiji period at the end of the 19th century. If you’re lucky enough, you could probably catch a glimpse of this black teeth phenomenon in Kyoto nowadays by Geisha ladies. In the olden days, most married Japanese women, some aristocrats, samurai and even those people from the imperial would blacken their teeth as some sort of a symbol of stature and pedigree. This is because in Japan, black color and things were considered especially beautiful. According to archeological researches done on ancient tombs and burial mounds somewhere in Japan, the custom of Ohaguro or blackening the teeth had existed since the prehistorical ages. Dictations of it were even included somewhere in the famous novel, Tales of Genji or Genji Monogatari and Tsutsumi Chuunagon Monogatari that were written in the Heian period and within the ukiyoe art of the Edo period. The term Ohaguro itself is a word used by the Japanese aristocrats. In Japan, it existed from ancient times, and it was seen among the civilians up until the end of the Meiji period.perhaps you’ll wonder why would the wife of the samurai would dyed their teeth black? Other than being thought as beautiful, other guesses include that they want to maintain dental health and protecting ugly tooth as such. Besides, a woman who has black teeth is obviously a married woman and no man should try to woe her. (References to ohaguro exist in the Genji Monogatari and Tsutsumi Chuunagon Monogatari) Ohaguro was practiced by aristocratic men and women who have reached puberty and celebrated their genpuku or mogi, Tairas and other samurai, members of the imperial family who had finished their hakamaza, a ceremony where a child is fitted with a hakama and pages working at large temples. At this period, they even shaved off their eyebrow and painted their eyebrow instead. This tradition continues in the imperial family until the end of Edo period. Ohaguro was used among adults and also during political marriages, when a female child of the military commanders had their teeth painted black as a symbol of the coming of age. Even a commander who had been struck in the head and had distorted appearance would wear average womens’ makeup and would blacken their teeth to avoid appearing ugly. Only the men of the imperial family and male aristocrats still practiced Ohaguro, but there are still practices of blackening the teeth among the common married women, unmarried women who are already pass their prime time, which is 18 years old as well as Geisha and prostitutes. For people who live outside main cities, this practice still existed during special celebration such as matsuri, wedding ceremonies and funerals. On February 5, 1870, the government banned the practice of ohaguro, and the process gradually became obsolete. Ohaguro was closely related to Japanese ghost (youkai) stories and urban legend. One famous story was Ohaguro Bettari. Ohaguro bettari beholds the image of a Japanese lady in a bridal kimono with blackened teeth or ohaguro but she also appeared with no other facial features or remarks, meaning no nose or eyes but a blank face with just black teeth shown, eeriely. You can say it is a like some sort of a typical ancient Asian female ghosts. It was also said that Ohaguro bettari haunts temple grounds and shrines during nighttime and distracting men with their seen beauty from behind but scares them away with their upfront features. But I guess, who would stop to have a second look at a female lady in bridal suits walking alone in a quiet and dark temple grounds at night right?! Japanese referred their process of teeth blackening as Ohaguro. The Ohaguro trend began under the Heian Era (794 – 1192). The word Ohaguro is derived from the Japanese word, ‘kuro’ which “expresses darkness after the sunsets” (Fukagawa, 2008).In ancient times, night was considered as the “time when evil spirits rampant. Black was ill-omened and hated as a color which means to be wrong” (Fukagawa, 2008). However, the Japanese, whom practice Buddhism, referred black as an unchanging color for which cannot be dyed with another. “Color has many symbolic properties and is often adapted in many societies around the world” (“The black teeth,” 2010). The reason why one chooses a particular color have their own reason and meaning behind it. This is why Buddhism had a great influence and impact on choosing the color black because they believed it was a static color that visually symbolizes constant strength and dignity. What are Ohaguro’s made out of and how are they used? The Japanese have a unique way of handling and making the ingredients of Ohaguro. They have a large round container called ‘mimidarai’. Sitting on top of the container is a thin tray called ‘watashigane’. On top of the tray is the ‘kanewan’ which is the bowl that the dye is mixed. A feathered tip brush was used to paint the teeth, the brush stick is made of bamboo. A porcelain bowl was used as well as a small box of fushi powder. The fushi powder is made from the “gallnuts of the Japanese sumac tree…, and kanemizu, which was made by fermenting iron filing in an acidic mixture of tea, vinegar and rice wine” (“Ohaguro – beautiful,” 2011). Having all these ingredients mixed together, should produce a black dye which could then be applied to the teeth. Unfortunately doing this process will not make teeth blackening stay permanent. They would quickly fade and the whole process would have to be done again. It is a labor intensive work to start everything from scratch. Not only that, but also the dye emits a foul smell. The dye had to be applied once a day or once every few days depending on the color left intact to the teeth. According to the Japan times from the Japan Society of Aesthetic Dentistry, they believed the reason why they do teeth blackening was because “Ohaguro had the effect of protecting teeth from cavities and periodontitis” (Fukue, 2010). They also believed that this “technique could potentially prolong lives” (Davis, 2011). In the Heian Era (794 – 1192) Ohaguro became popular among males especially court nobles and commanders. Samurais also use Ohaguro as a custom to show proof of loyalty and that a samurai does not serve two masters within a lifetime. The custom is said to have ended around the Muromati Era (1558 – 1572). During the Edo Era (1603 – 1867), the practice was followed by women. Women blacken their teeth to enhance their appearance when they are ready to find a husband. At that time blackened teeth was a trend and was thought that it made the women look beautiful. It signified unity and fidelity. They possibly believed that teeth were a visible part of the skeleton, which as a symbol of death, was unclean. It was also thought to believe in the Buddhist idea that white teeth reveal the animal nature of men and women and that the civilized person should conceal them, thus using teeth blackening. Because of the use of Ohaguro, it was quickly spread all over the country and became the symbol of married women. Ohaguro was also used for unmarried women who already passed their prime time which is eighteen years of age, as well as Geisha and prostitutes. “The color of teeth reflects the social conceptions of beauty, social status and age” (Fukagawa, 2008). On February 5th of 1870, the government banned the practice of Ohaguro, and the tradition was ceased. There is not much of a difference when compared with Japanese and modern American ideal dentistry. Americans however, do not practice teeth blackening. They believed that exposing the color of the enamel and dentin part of the tooth is what makes us feel natural. The anatomical features of both cultures of the Japanese and Americans are the same. The Japanese didn’t make any modifications in its structure and function of their teeth. Judging the lack of dentistry provided in ancient Japan, they probably left their teeth the way it was grown. That means tooth alignment could be deformed. Although they lack dental practices, one painting from ancient Japan indicated practices of full and partial dentures. Americans today use full and partial dentures too however, if there is a slight deformation in tooth alignment, it can be guided back to its natural form with the help of braces. Japanese practices of teeth blackening are strict compared to Americans. Japanese teeth blackening help judge a person by rank, age, and marital status. … In every part of the culture, color plays a huge role. There is a reason why one would choose a particular color as opposed to the rest because they have their own reason and meaning behind it. When one finds doing something to their teeth can make them look beautiful, others would do it until everyone within the region does it as a practice. We can now tell that although Japanese practices of Ohaguro teeth blackening are different from the American teeth whitening by appearance, they all have one same goal; making themselves look beautiful. Slightly different from the practised teeth blackening, according to Kirsten Refsing writing in Early European Writings on Ainu Culture: Travelogues and Descriptions (Volume 2), p. 16, Ainu women painted around their lips a dark blue black color as an indication of rank. The early Jomon peoples have so far not been found to have practised teeth blackening, though the custom of teeth ablation has been widely recorded for the Jomon period…parallel to practices by nearby temporal neighbours in southern Cambodia and northeast Thailand, suggesting a unique cultural behaviour for the region (“Cultural Modification of the Dentition in Cambodia“, K.M. Domett et al.). A strangely interesting custom that is often misunderstood is the Vietnamese ritual of tooth blackening or tooth lacquering. Tooth blackening is not totally uncommon for Vietnamese people living traditional lives. Many tour guides still tell tourists the blackening is the result of chewing betel nut which isn’t entirely true. The resin is diluted with lemon juice or rice alcohol and stored in the dark for a few days. It’s then applied with pressure to all the teeth. An application of iron (mainly from iron nails) or copper from green or black alum and tannin from Chinese gall reacts with solution to give a blue-black insoluble coating.